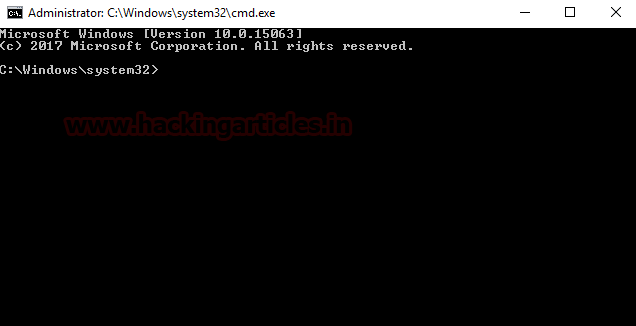 Open command prompt and check windows user account status using “whoami” command. Account name is “joe” and account status is ‘DefaultAccount’ which is a non-administrator account type. 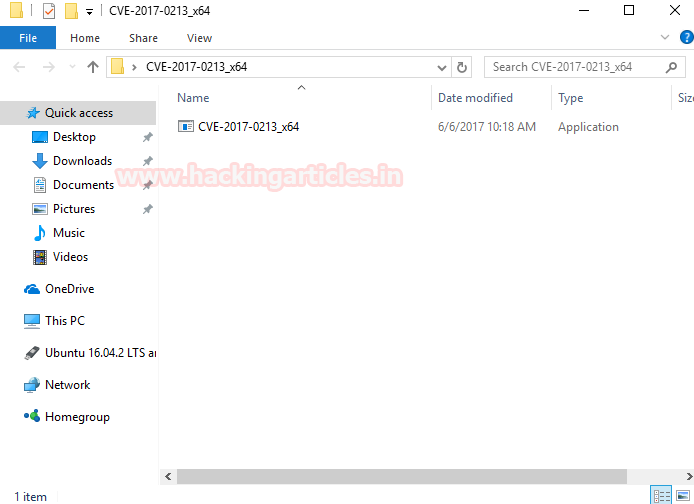 Now download “CVE-2017-0213_x64” from here and unzip in your PC. Go to the folder and you can find the .exe file, double click on it to run it. 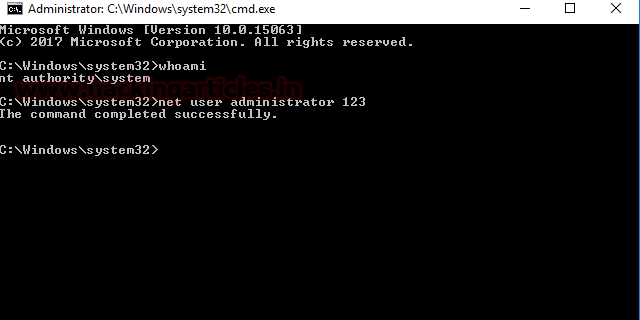 The moment you double click on it, it will automatically open a new command prompt with administrator privileges. 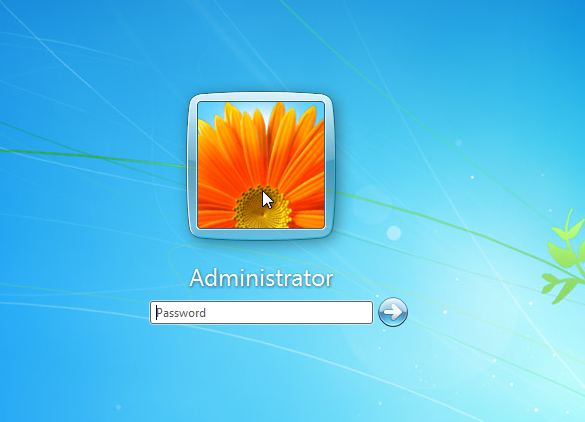 Use ‘net user’ command to change the administrator account password. Message ‘The command completed successfully’ will appear. You have now successfully changed the administrator accounts password. 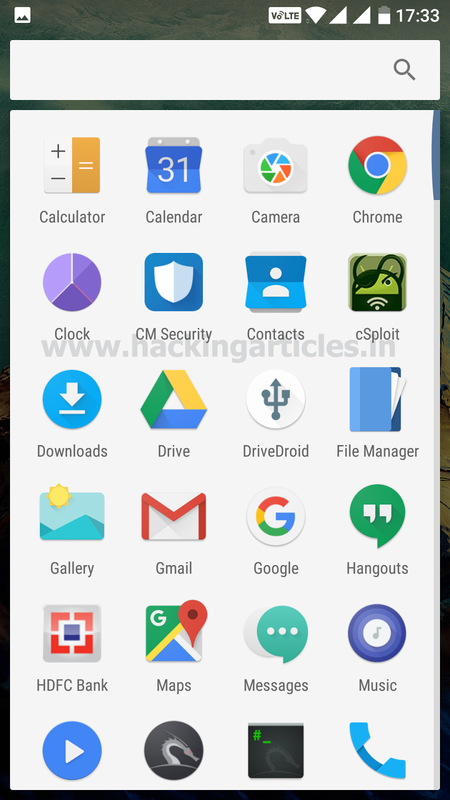 Drive Droid is an Android application that allows you to boot your PC from ISO/IMG files stored on your phone. This is ideal for trying Linux distributions or always having a rescue-system on the go... without the need to burn different CDs or USB pen drives. 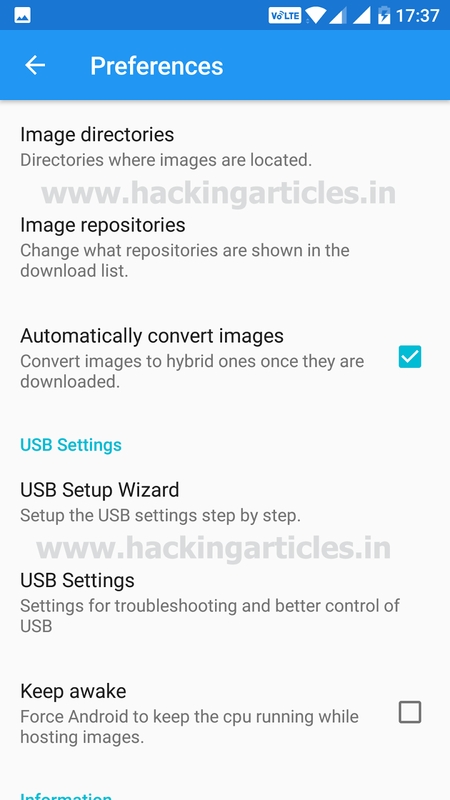 Drive Droid also includes a convenient download menu where you can download USB-images of a number of operating systems from your phone. You can also create USB-images which allow you to have a blank USB-drive where you can store files in. Blank images also allow you to use tools on your PC to burn images to the drive and create a bootable USB disk that way. You can manually download it from google playstore. Note: need root privilegde means you need rooted phone. Install DriveDroid app on your smartphone and run the application. Click on plus sign at the lower right corner to add any iso image file. Under preference here we need to select image directories so that we can browse konboot iso image file. Now plug the USB cable between phone and system for booting it from your phone and restart the system (pc) then continuously press function key of your desktop system. Great!!! Successfully you will get administration console; now hit the enter button on the key board. This will bypass the admin console without entering password. 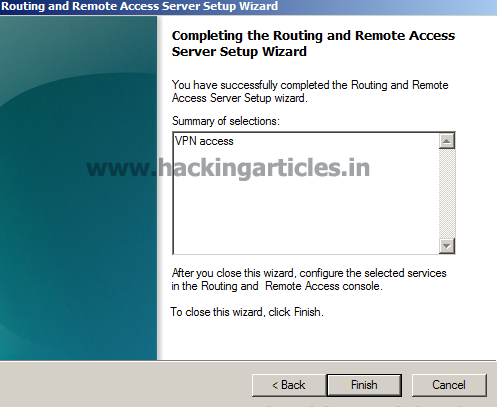 You just need to follow the basic steps for configuring a remote access virtual private network (VPN) server using Server Manager, the Add Roles Wizard, and the Routing and Remote Access Server Setup Wizard. After you finish configuring a basic remote access VPN server, you can perform additional configuration tasks on client depending on the way you want to use the remote access VPN server. 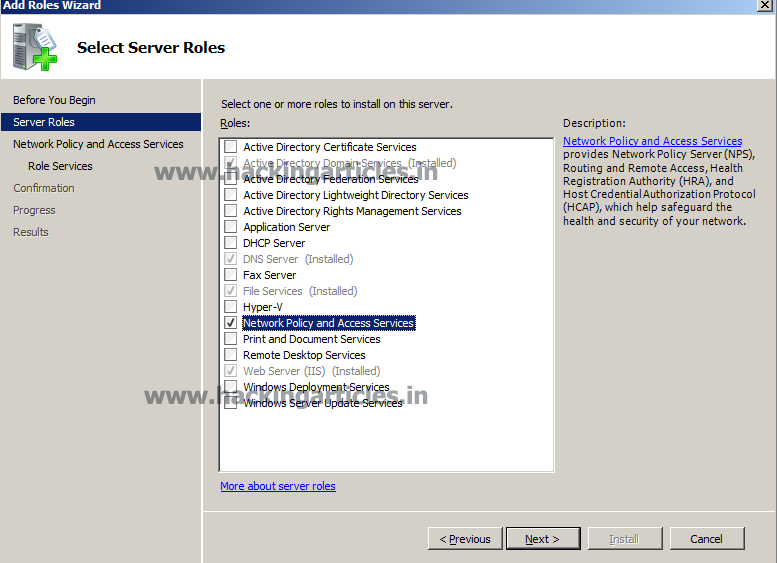 Check the status of “Network Policy Server” under Role Services and click on next. Network policy and access services provides Network Policy server (NPS), Routing and Remote Access (RRAS), Health Registration Authority (HRA), and Host Credential Authorization Protocol (HCAP) ,which help safeguard the health and security of your network. Read the requirements and click “Next” to continue. On the following screen “Select Role Services” for Network Policy and Access Service, place a check mark on Routing and Remote Access Services and make sure “Remote Access Service” and “Routing” are selected as well. Click next to continue. To install following role services for Network Policy and Access Service click on Install. This show the summary of Remote Access services and Routing were installed successfully. Once the installation finishes, click close to end the wizard. Till here I have completed installation of VPN in server. 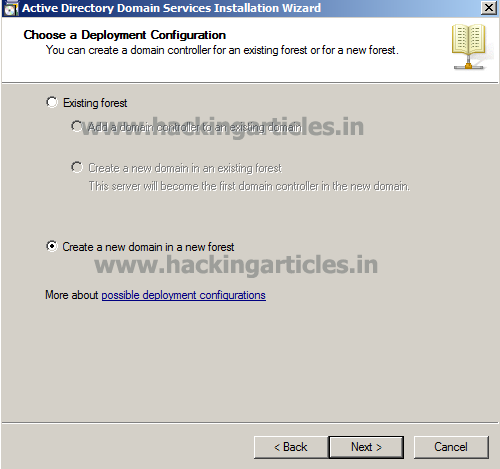 To complete configuration in Routing and Remote Access follow these step. In the console that opens, right click your server name and right click on “Configure and Enable Routing and Remote Access “this configures Routing and Remote Access on the selected server. In the Wizard you can enable any of following combinations of services. I will choose Custom Configuration for my server and click on Next. 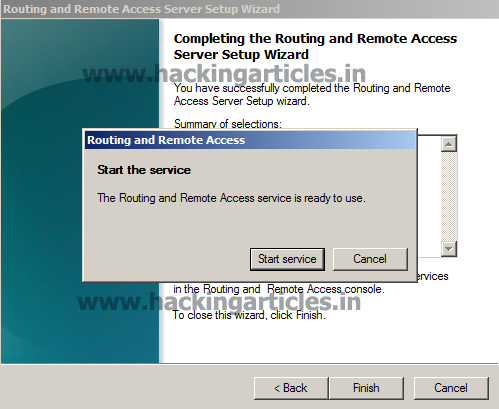 Next is Routing and Remote Access server setup wizard in which I am going to decide which type of access should be allows to client to access server network. Now you have successfully completed the task of VPN access service in your server, to close this wizard click on finish. 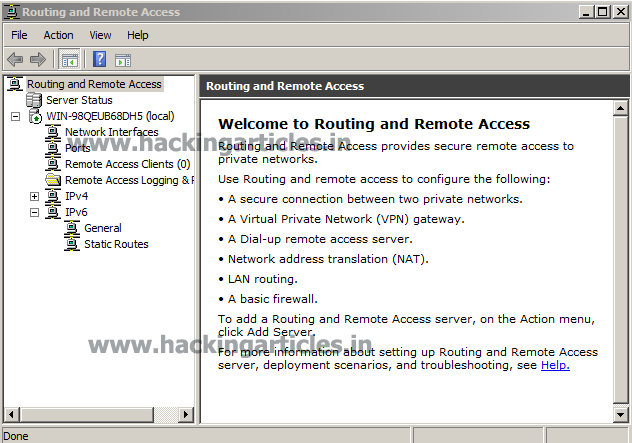 Now you will get the dialog box which shows message that Routing and Remote Access service is ready to use. So click on Start Service. Once the process is finished, and you are back on the main Server Manager window, routing and remote access should now be up and running. 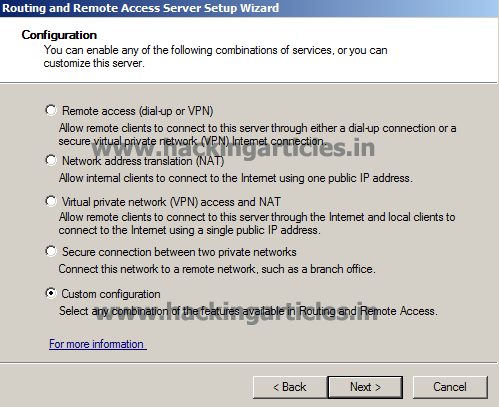 Once you have successfully configuration of Routing and Remote, the administrator will select the desire user and give privilege to access the server through VPN connection for connecting client from different location. Click on the Dial-In tab and under “Network Access Permission” select Allow Access. Click on Apply and Ok to finish. Only selected client will be able to connect with server network through VPN using different network. This was first phase of VPN configuration on server-side performs by administrator. Setting up a client connection to a VPN network is very similar to setting up an old-fashioned Dial-Up connection through a phone line. 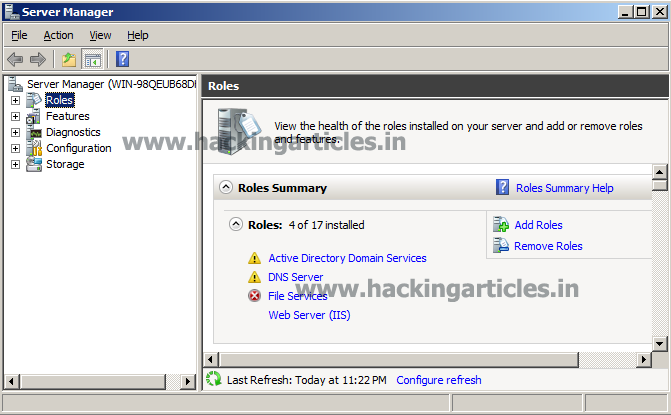 You need to enter a server address (hostname or IP), user and password. Once connected, this system will receive an IP address within the VPN network, so you’ll be able to access it from any other machines also connected to the same VPN network. Change your network settings click on setup a new connection or network option, this contains different types of network connection options like broadband, dial-up, VPN or set up a router or access point. Here you can many other options as I told, I will choose connect to a workplace to set a dial-up or VPN connections to your workplace. This option will set the connection to a workplace or say to our server for the client. 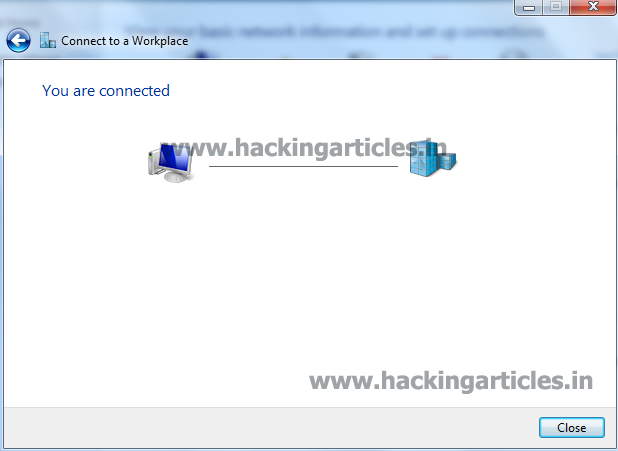 Now you will see next wizard for connect to workplace, which will ask for type of connection through which you will connect to your workplace or server. My option will be use my internet connection (VPN) and the will be established using internet. 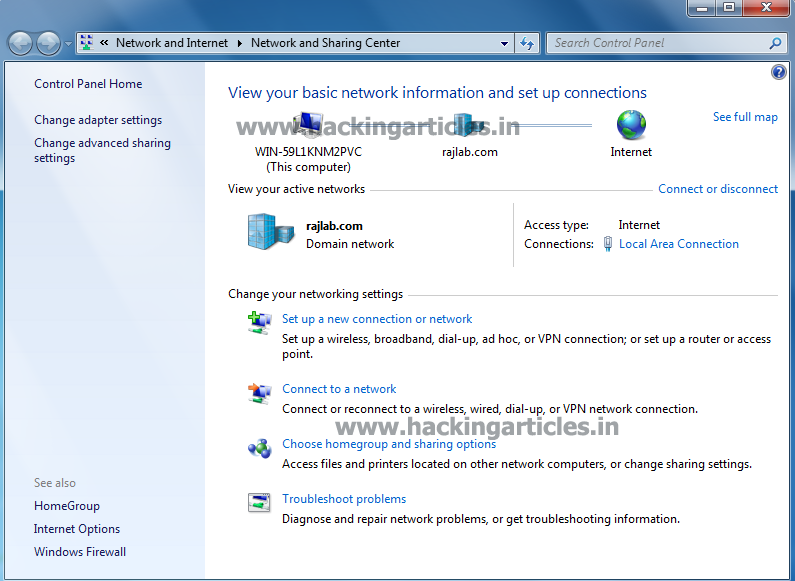 Now for connecting network you must aware of IP address of workplace or say server. 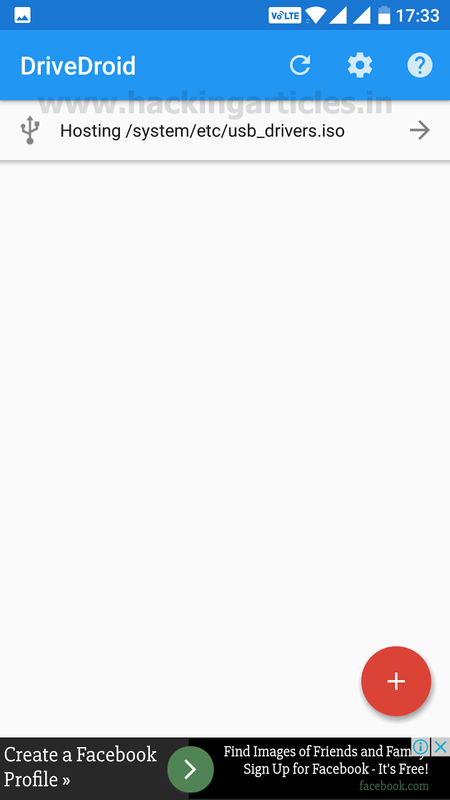 192.168.0.106 it is the IP of my windows server 2008 r2 having VPN setup and configuration ,so I have mention this IP in Internet Address for connection. Now I had set privilege for user pentest to Allow Access for VPN connection. When you will try to connect it will ask for your credentials for authentication. 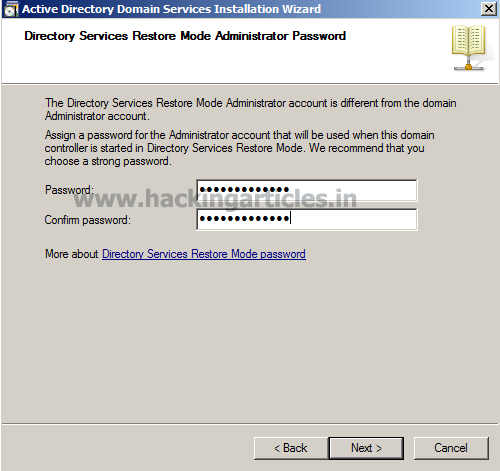 Client will enter his username and password for establishing connection and click on connect. When given credential will be found authorized, it will allow client to connect with workplace and provide VPN connection. To ensure that you have successful VPN connection open your command promot and type ipconfig this show another IP over LAN. PS Tools Kit is a collection of 13 tools developed by Mark Russinovich. These tools are command-line tool that lets you execute processes on remote systems and redirect console applications' output to the local system so that these applications appear to be running locally. All of these are special tools that are compatible with the NT windows version or later. Being a console application, these tools can work on both local computer and remote host. 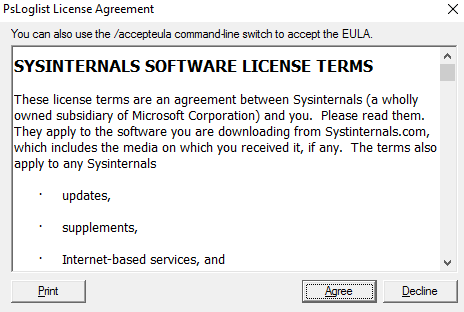 These tools require no manual installation of software on the remote system, and they let you specify alternative credentials to access the remote system. The "Ps" prefix in PsList relates to the fact that the standard UNIX process listing command-line tool is named "ps", so this prefix has been adopted for all the tools in order to tie them together into a suite of tools named PsTools. 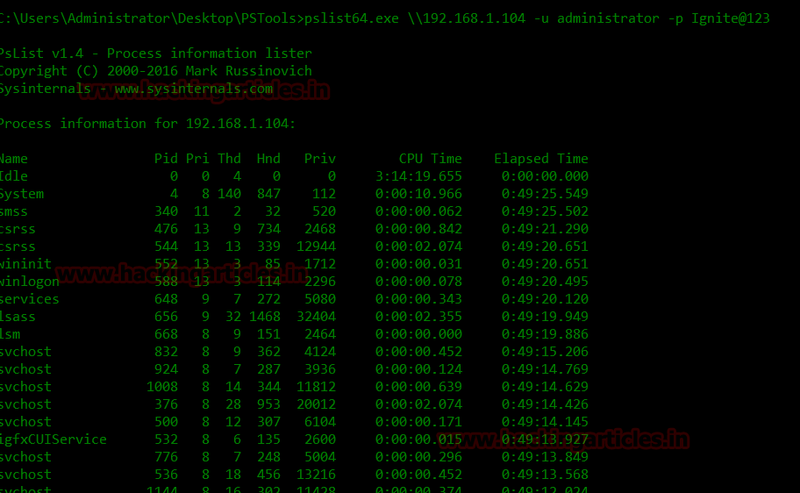 Once you have open PSTool kit, run dir command so that you can see the list of al tools. Executing these commands informs us about the SID of our victim's PC. After this command has been run, it will give you the information as you can see above. 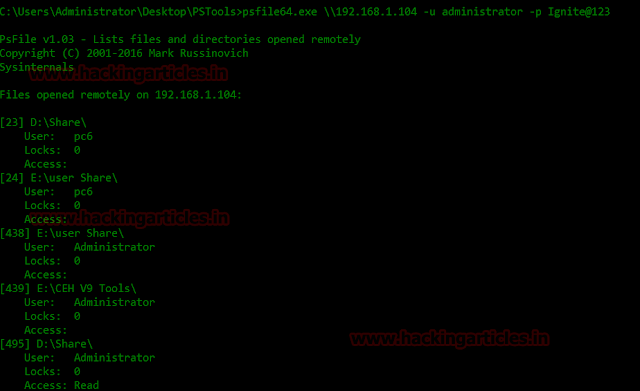 Execution of this command will help us to see every file and directories that are remotely open on the PC of victim. 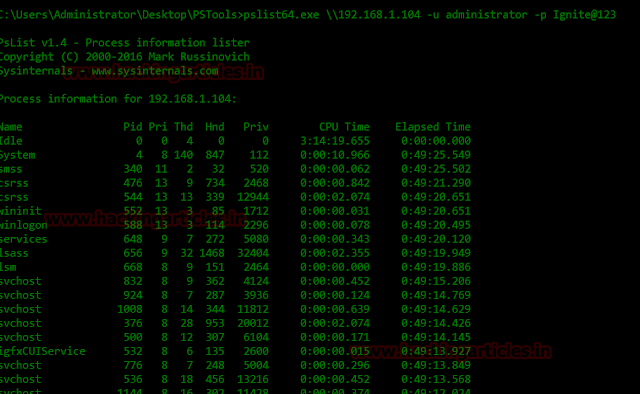 This command lets us see the list of all the files on our remote PC as seen above. You can result in the above pic. So, like this our command is successful as we have our desired result. This can successfully change the password as shown in above image. And as shown in the image above the remote PC will shutdown in 20 seconds. 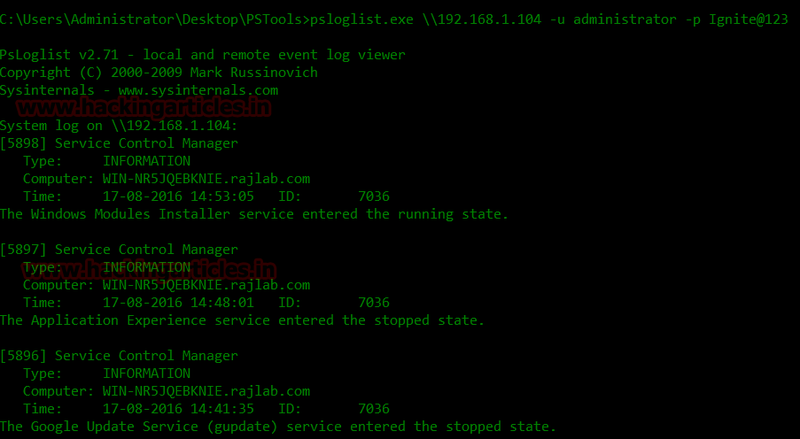 So, these were tools in the PSTool kit and the commands to run them. These tools make our work alot easy and come in handy. 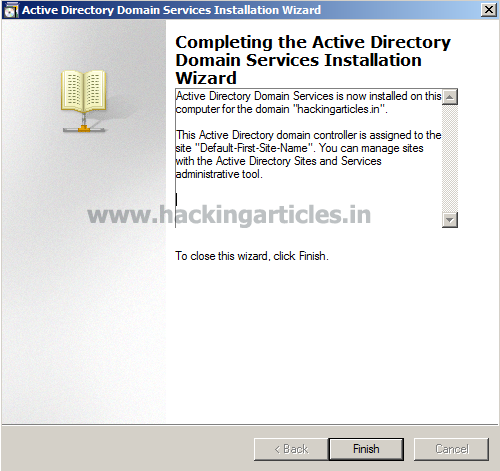 To install active directory in the windows server, assign static IP address. With Run as Administrator. 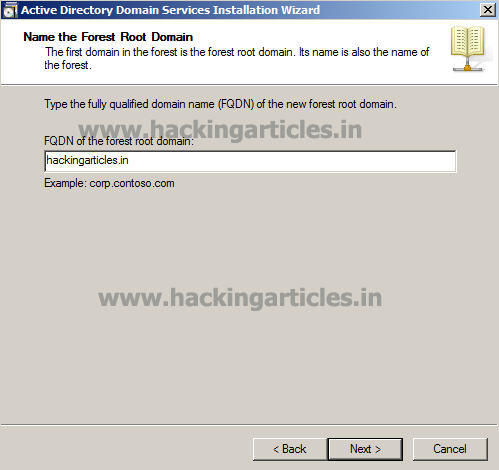 Click OK.
To start the installation click on "Next"
Now we have to provide the name for new domain. It must be FQDN. In our case I used hackingarticles.in as the domain. Please click "Next" after it. 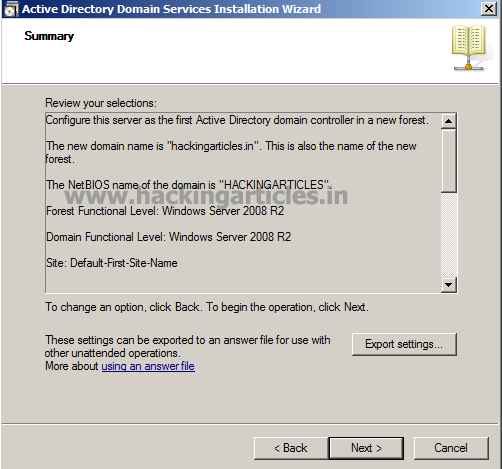 Select forest functional level to Server 2008 R2 to add domain controller of Windows server 2008 R2 or later. 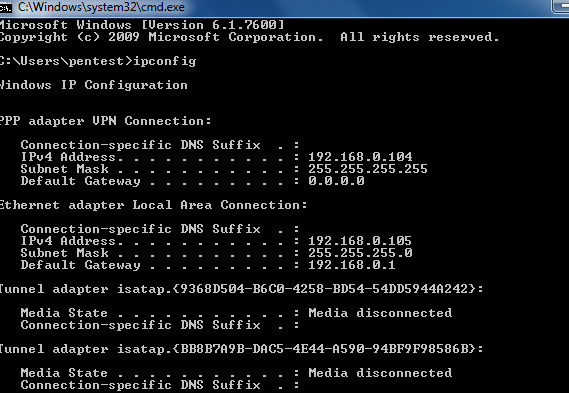 In next window since it's the first DC we should make it as DNS server too. 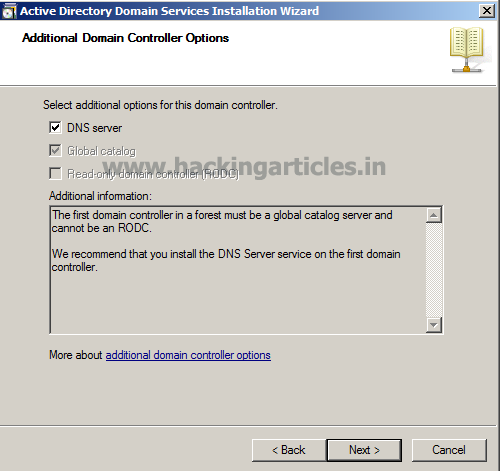 Leave the default selection and click on "Next"
If the wizard cannot create a delegation for the DNS server, it displays a message to indicate that you can create the delegation manually. To continue, click "Yes"
In next window it will show up the database location. If you want to change it physical location Click browse and do the changes or click on “Next" to proceed. Then it will start the installation of the AD. It will take some time to complete. When its done you will be notified and required to reboot your PC.